Thomas J. Romano, M.D., Borys Buniak, M.D., Sara M. Gosselin, M.D., Aran Laing, M.D., Hui Hing Jack Tin, MD, Carol A. Curreri, R.N., FNP, Sara Gleasman-Desimone, ANP, Ph. D., Judy Diliberto, P.A., Melanie Salanger, PA-C, Matthew Romano, PA-C, and Carolyn Gaulke, RN, FNP. We are a dedicated group committed to preventing colon cancer and providing the highest quality of health care to our patients. We have designed our website to provide you an easy way of getting information on our practice and interests. If you have any questions, please contact us. We look forward to hearing from you. There are many procedures that are performed by our doctors in our endoscopy suite (DDC) and hospitals. We realize that some procedures may make you a bit nervous, so we have provided some facts that may help you understand what will happen to ease some concerns. Whether you are having a colonoscopy, upper endoscopy, dilation, sigmoidoscopy, or ERCP, you can find information you need on our site. 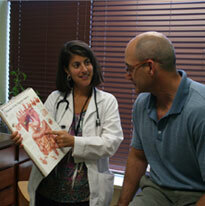 We know that medical information about gastroenterology (digestion) and hepatology (liver) may be a lot to "digest". Our website offers the most current information to answer some questions you may have. Learn more about abdominal pain, acid reflux (GERD), Barrett's, celiac, colitis, colon polyps, constipation, Crohn's, diarrhea, diverticulosis, gas, heartburn, hemorrhoids, hepatitis, hiatal hernia, high fiber diet, irritable bowel syndrome (IBS) and trouble swallowing. We also have many diets, links and frequently asked questions as a quick reference. Welcome to Gastroenterology & Hepatology of CNY! Click here to print and fill out some forms needed before your procedure(s). Click here to schedule appointments, and/or communicate with us. Click here to learn about our providers. Digestive Disease Center of Central New York (DDC of CNY) is located adjacent to the offices of Gastroenterology and Hepatology of CNY. DDC of CNY is a certified single specialty ambulatory surgery center for endoscopy, owned and operated by Drs. Romano, Buniak & Mitchell. We are a New York State certified center, AAAHC accredited (since 2010) and ASGE quality unit. We can provide total comfort during your procedure with anesthesia providers.